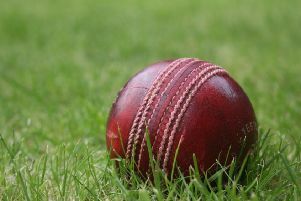 The Grantham and Melton Cricket Association league schedule made way for cup action on Sunday. In the Golding Cup, Egerton Park topped Group B after seeing off nearest rivals Ashby Carington by 50 runs. Park elected to bat first, but were skittled for just 125 with Zaheer Hussain (31) and Alex Barber (22) making the telling contributions, only bettered by extras (32). James Troop did the main damage, taking 4 for 20, but was well supported in the Ashby attack by Joe Dyer (3 for 17) and Asish Didwania (3 for 11). But the home side fared even worse in reply, only opener Martin Troop (27) and David Henderson (10) reaching double figures as Ashby were castled for 75. Tom Glover (4 for 21) and Kamal Panchal (4 for 9) starred with the ball for Park. Belvoir finished top of Group A after Hinckley Town conceded their match. * In the Golding Shield there were home wins for Queniborough Second XI (281-7) against Empingham (114-8), as well as Bottesford (125-7) over Stamford Town (124-8). * In the Golding Shield Plate, Matthew Bartram, John Pook and Jack Wood all hit half-centuries for Barkby United (207-5). But it still wasn’t enough to win as Austen Imber’s magnificent unbeaten 142 won the match almost single-handedly for Barrowby (208-6). Similarly a century from Phil Stimson (12) set Tilton and Lowesby on the way to a big total of 261-7 at Newtown Linford. But his innings was trumped by Fred Bainbridge whose unbeaten 147 helped guide the hosts to a six-wicket win with almost four overs to spare. Elsewhere Tom Corbett’s unbeaten 110, and 74 from Ben Drake, eased Syston Town (261-4) to a six-wicket win over visitors Woolsthorpe-by-Belvoir (259-3).